This one had been brewing for basically a lifetime. 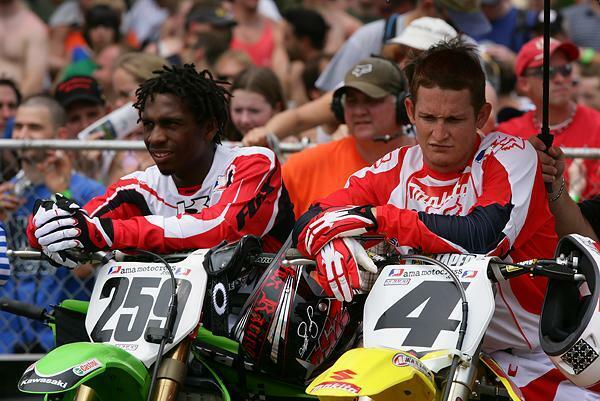 Ricky Carmichael and James Stewart were just far enough apart in age to where they had never raced against each other at any level. Instead, they broke each other’s records. When Carmichael was finished racing the AMA Amateur National at Loretta Lynn Ranch, he held the all-time record for amateur titles. Then Stewart broke that record. When Carmichael was finished racing the 125 class as a pro, he held the all-time record for 125 National Motocross victories. Until Stewart broke that record. And the entire 2004 season served as a massive set up, with Carmichael winning 24 out of 24 motos in the 250 class, and Stewart winning 23 out of 24 in the 125s. Finally, in 2005, they would meet in the 250 class. This was a clash of titans. The battle should have begun in supercross, but Stewart crashed and broke his arm in the second race of the season, leaving Carmichael and Chad Reed to battle for the championship, with Carmichael coming out on top (Carmichael’s AMA Supercross Championship was the first for Suzuki since Mark Barnett collected that title over twenty years earlier). Stewart did return late in the supercross season to collect a few wins. Outdoors, though, Carmichael would be armed with Suzuki’s brand-new RM-Z450, while Stewart would still ride a KX250 two-stroke. Unfortunately, the outdoor battle never materialized. Carmichael waxed everyone at the opener at Hangtown, while Stewart struggled and eventually pulled out of the second moto with an illness. Stewart was on his game at High Point. He passed Carmichael in the first moto and began pulling away slightly. Before long, Carmichael latched onto Stewart’s pace and hung there. He retook the lead in spectacular fashion, jumping over Stewart’s head on a tabletop, and pulling away from there. Stewart then pulled out of action again at Southwick. At Budds Creek, Stewart was asked what it would take to beat Carmichael, and he said, “A 450.” But Kawasaki didn’t have one. So Stewart tried to soldier on, often getting booed by the same fans that had cheered him wildly while he was winning everything in sight on a 125. It was a strange year. Carmichael kept on winning. He crashed in the first moto at Southwick, allowing Reed to take the first 250-class moto win of his career. Beyond that, he was pretty much aces, going as fast on a Suzuki as he had on a Honda. 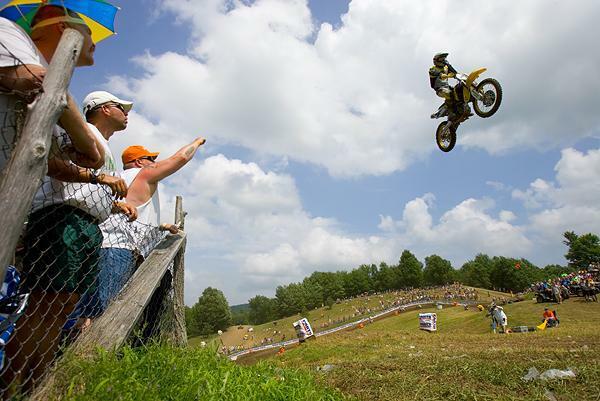 Then came Unadilla. Carmichael fell, and Stewart took the lead. Carmichael was charging, and late in the race began to close in. This was the showdown everyone wanted to see. Carmichael got inside and made the pass, but Stewart tried to cross back underneath. But Carmichael didn’t drift wide, so when Stewart hit a jump, he came down right on top of Carmichael’s back, sending them both the ground. Kevin Windham inherited the moto win, Stewart was knocked out, and Carmichael picked himself up to come back in moto two and win the overall. 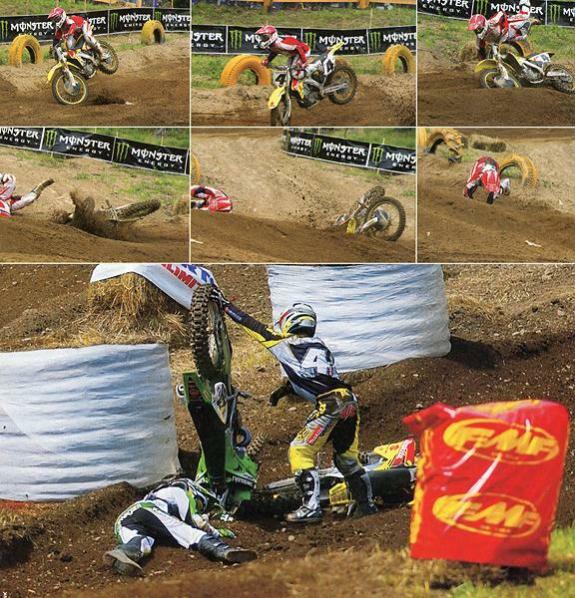 For Stewart, Unadilla was rock bottom. No doubts for the rest of the year: RC was still the best in the business outdoors. But what about Stewart’s vacated throne in the 125s? Well, the ’05 125 class produced one of the closest and most dramatic battles you’ll ever see (which is the same thing we wrote about ’89, ’92, ’95, ’00, ’01 and ’03). With Stewart out, the class was stacked with contenders. In the first moto of the season, though, Suzuki’s Broc Hepler put on a clinic, working his way into the lead and taking the win. Hepler finished second to Stewart in points during the previous season. Perhaps the sophomore was the best in the class? Well, he tipped over in moto two and threw away the overall. 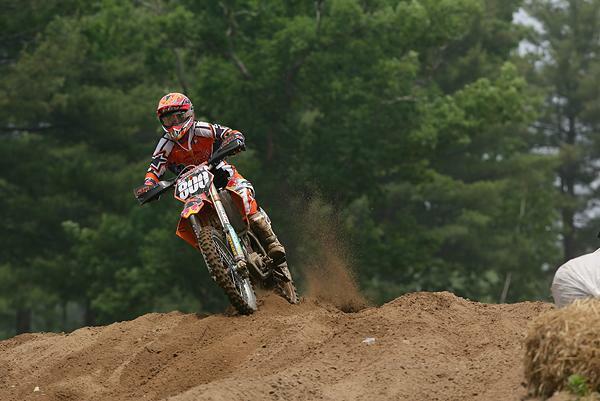 Up front, KTM’s Mike Alessi led the way in his debut race in his first pro season. Looked like Mike had the moto won until Monster Energy Pro Circuit Kawasaki’s Grant Langston made a heroic run on the last lap and made up huge ground. In the last turn, Langston went to the inside of Alessi and smashed into him. Alessi crashed and Langston stole the moto win, but also broke his ankle in the collision. Langston would try to race through the pain each week, but his results were sporadic. Other contenders would win races here and there, but an unlikely points leader emerged: 2001 125 Champion Mike Brown. 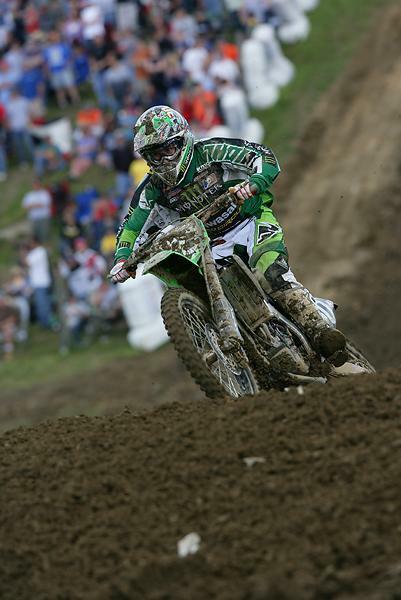 Brown was supposed to race in Europe for the ’05 season, but his deal collapsed, so he put together his own privateer Honda effort in the U.S. and found himself leading the points by mid season. Brown was looking to become the first privateer to ever win an AMA National Motocross Championship, but for some reason, he began to falter at mid season. Conspiracy theorists say that Pro Circuit, who was building Brown’s engines, was purposely giving him bad stuff to help their own team riders catch him in points. Others said Brown was cracking under pressure. Whatever the reason, he faded out of contention. This left Alessi in the points lead. Hepler finally figured it all out and won some races, as did Honda’s Andrew Short, and even Langston got a win, injury and all, at Red Bud. But the most consistent contender was Monster Energy Pro Circuit Kawasaki’s Ivan Tedesco, who won in Colorado (the Thunder Valley national replaced Troy, Ohio on the schedule) and soon had the points lead. Heading into the finale, it looked like Tedesco had the crown pretty much wrapped, but he derailed a chain in the first moto and lost a ton of points. Alessi had a shot heading into he final moto of the season. Then Alessi did something crazy. He took Tedesco out and stood on his bike so Tedesco couldn’t get back on. Alessi even reached for Tedesco’s kill switch to try to turn his bike off! It was an amazing series of events, both riders finished way back, and Alessi didn’t make up enough ground to win the title. At the end of the season, the AMA stripped Alessi of his Glen Helen points, which moved Andrew Short up to second for the year. Alessi was also stripped of his AMA Rookie of the Year award. It instead went to Estonia’s Juss Laansoo. Remember him? Tedesco was considered a supercross specialist when the year began, but he had proven his outdoor chops during this wild season, and claimed the championship. Brown was originally scheduled to race the Motocross des Nations, but the team pulled him off in favor of Tedesco. He teamed with Carmichael and Windham, and the boys pulled through, winning the MXdN for the first time since 2000. 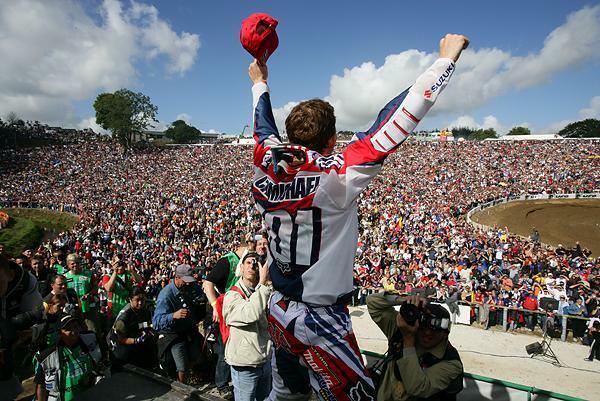 Team USA had gone through quite a few starts and stops in MXdN effort since their massive win streak had ended in 1994, but this 2005 win was the catalyst of a new level of effort. At that time, finding the funding to race the event was difficult, so MX Sports, producers of the Loretta Lynn event (and sister company to this site) sponsored the team and picked up the tab. With the win came more interest, and the U.S. has sent a strong team (and won the event) ever since. Once again the season ended with no doubt that Carmichael was the greatest motocross rider in the world. Would things change if Stewart got a crack at him on a 450?